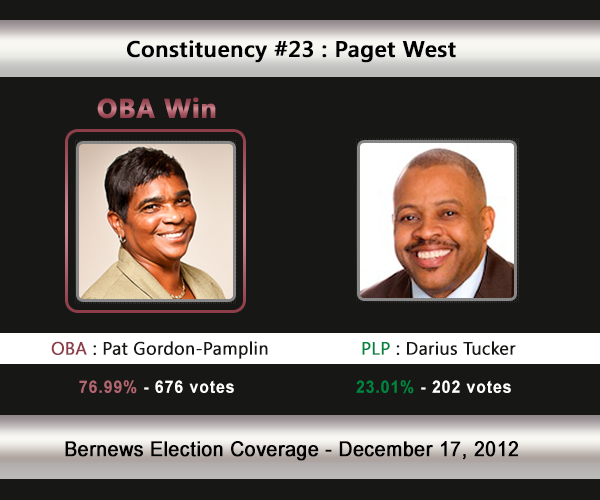 [UPDATE Dec 17: Election Results] Incumbent Patricia Gordon-Pamplin [OBA] has retained her seat against Darius Tucker [PLP]. The OBA’s Patricia Gordon-Pamplin is being challenged by the PLP’s Darius Tucker — who moved from Constituency #7 Hamilton South which he won under the UBP’s banner in 2007. In the 2007 General Election Ms Gordon-Pamplin [running under the UBP’s banner] won 75.85% of the vote vs the PLP’s Rolfe Commissiong [732-233]. In the 2003 General Election, Ms Gordon Pamplin won with 75% of the vote against Leopold Kuchler [PLP] who received 25%. 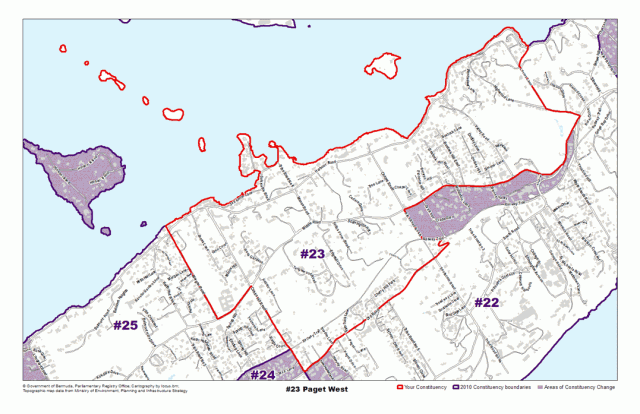 Areas the Paget West constituency compromises of, or is located by, include Morgan Road, Harbour Road, South Road, White Sands Road, Ord Road, Cobbs Hill Road, Middle Road as well as Burnt Island, White’s Island, Doctor’s Island, Reid Island, Spectacle Island and World’s End Island. Darius D. M. Tucker is the owner of DT’s Services, a carpentry company he started after leaving his facility management job at Wilkinson Estate Limited. Mr. Tucker is a carpenter with an immense love of of the trade in Bermuda. Mr. Tucker attended Southampton Glebe Primary School & Warwick Secondary School and believes that his years spent in these schools as being the best time of his life. A carpenter by trade, he learned right there on Cobb’s Hill. He began working in his chosen trade directly after high school and was later certified at the Bermuda College. Growing up with family on Cobb’s Hill and Cherry Hill Park, Mr. Tucker attended Sunday School at Bright Temple A.M.E. Church. As an adult, Mr. Tucker joined St. John A.M.E. Church, where he attends regularly, and is a Trustee. He works tirelessly to ensure that people in trades are continuously progressing in their chosen field. He believes that his greatest asset is his love for the people of this country. This is illustrated through his dedication to assist in any way that he can with Bermuda’s youth and seniors. He maintains his connection to the community by direct contact to the people through his associations with Warwick Workmen’s Club. As a former Director, he has been able to hear first hand of the challenges and opportunities for tradesmen in Bermuda. He understands first-hand how the economic downturn has affected those in the construction industry. Mr. Tucker is married with two children. Pat comes from a very “political” family. Her father served as a Member of Colonial Parliament and her sister served as Bermuda’s first female premier. Pat was determined to contribute to the politics in Bermuda in her own right. Pat took up an immediate challenge on entering the political arena to correct an injustice that was apparent when Bermudian men were treated differently from Bermudian women if they should marry a foreign spouse. So determined was Pat to right this inequity, having been subjected to the difficulties emanating from that policy, that she founded the Alliance for the Protection of Rights of Bermudian Women, and challenged the then government by running as an independent candidate in one of its most marginal constituencies at the general election of 1993. Notwithstanding that she was a member of the party that she challenged, it was standing up for that which is right, not just for herself, but for those who may not have the courage to stand for themselves, that created the impetus for her bold actions. In 1998 Pat was appointed to the Senate, soon afterwards challenging and winning a primary and parliamentary seat in 1999. . Re-elected in 2003 and again in 2007, Pat continues to serve Bermuda and her constituency with vigour. From 2006 until December 2007, Pat served as Deputy Leader for the UBP, and then as acting leader until a permanent replacement was elected by the membership. During her parliamentary career, she has shadowed different portfolios including Youth, Sport & Recreation, Labour & Home Affairs, Finance and Public Works. She serves on the Public Accounts Committee for the House of Assembly as well as the Audit Committee, and is a member of the panel of chairpersons for the House. Pat values fairness above all, and she is willing to take on the most apparently insurmountable of tasks in order to ensure that equity prevails. Educated in London at the City of London Polytechnic, Pat is a Fellow of the Chartered Association of Certified Accountants, having qualified in 1979, and completed her article clerkship under the auspices of KPMG. She is the Chief Accountant for a group of Class IV insurance companies, and has worked in the insurance industry for some 25 years. She has represented the Bermuda parliament at various CPA seminars, including most recently the CPA congress held in Nairobi, Kenya. Pat is the mother of two sons, aged 45 and 26. She serves as the Senior Usher for her church, St. Paul’s AME. Pat loves playing tennis and is a registered umpire, participating in most local tournaments. In her free time she writes poetry.